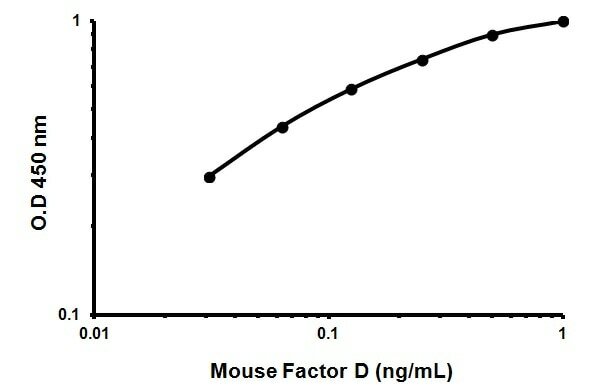 Abcam’s Factor D Mouse in vitro ELISA (Enzyme-Linked Immunosorbent Assay) kit is designed for the quantitative measurement of Factor D in cell culture supernatants, urine, plasma and serum. A Factor D specific antibody has been precoated onto 96-well plates and blocked. Standards or test samples are added to the wells and subsequently a Factor D specific biotinylated detection antibody is added and then followed by washing with wash buffer. Streptavidin-Peroxidase Conjugate is added and unbound conjugates are washed away with wash buffer. TMB is then used to visualize Streptavidin-Peroxidase enzymatic reaction. TMB is catalyzed by Streptavidin-Peroxidase to produce a blue color product that changes into yellow after adding acidic stop solution. The density of yellow coloration is directly proportional to the amount of Factor D captured in plate. Factor D cleaves factor B when the latter is complexed with factor C3b, activating the C3bbb complex, which then becomes the C3 convertase of the alternate pathway. Its function is homologous to that of C1s in the classical pathway. Complement factor D deficiency (CFDD) [MIM:613912]: An immunologic disorder characterized by increased susceptibility to bacterial infections, particularly Neisseria infections, due to a defect in the alternative complement pathway. Note=The disease is caused by mutations affecting the gene represented in this entry. Our Abpromise guarantee covers the use of ab170244 in the following tested applications. ab170244 has not yet been referenced specifically in any publications. Publishing research using ab170244? Please let us know so that we can cite the reference in this datasheet. Hello, I would like to know about the source of the antigen (standard recombinant protein) in Factor D Mouse ELISA Kit (ab170244). Is it from E.coli? I confirm the source of the antigen used in this kit is E.coli.